This blog almost died for a number of reasons. In case there’s anybody still out there, I produced a short film last year for the Digital Shorts Wales scheme, which was funded by the (now defunct) UK Film Council. This short is called Bright Lights, and it’s now listed here on IMDb. 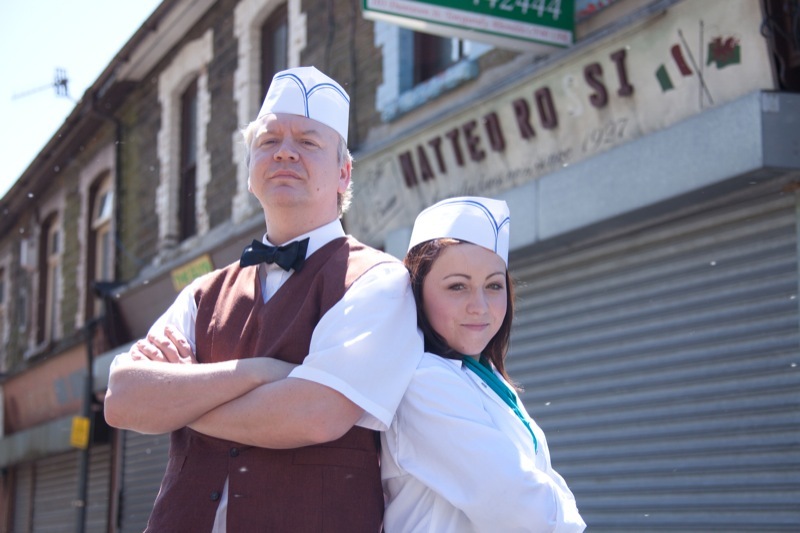 Directed by Hefin Rees, it’s a sweet little film about a teenage girl in the South Wales valleys, and her relationship with her Ice Cream Man Father. We’ve started submitting it to festivals, so hopefully it will be on screens soon. I’ll post any news here. I’ll leave you with a photo of Catrin Faulknall as Ali, and Ian Staples as Dad, taken by our DOP Steven Davies. Here’s the new trailer from SSAW – Skillset Screen Academy Wales, edited by Ewan Jones-Morris. It’s compiled of films made with the support of the Screen Academy between 2007 and 2009. There’s lots of footage from 17 included, check it out. Further to the last post, you can find information about the screening of 17 at this page of the Salford Film Festival web site. If you’re in the area this Sunday, check out the film! 17 will screen as part of the young people’s strand at the Salford Film Festival this weekend – I’m particularly happy about this as it’s been selected by a panel of young people who are programming the strand of the festival themselves. What I hope this means is that the film deals with issues that they relate to, and that it’s relevant to those who are growing up here and now. Of course, they might just like it because it’s got swearing, violence and a banging drum n’ bass soundtrack, but I’d like to think that it’s more than that. As I’m sure I’ve mentioned before, the film doesn’t offer any answers or solutions to the problems it deals with, but I honestly believe it raises issues that lots of people growing up in Britain today have to face, and I hope that the young people of Salford are interested in the film because of this. Thank you to the festival for selecting the film. This week has seen the launch of the Digital Shorts Wales scheme. Finally, a new short film scheme in Wales with some decent budgets for the films, apparently between £7k and £13k. They’re accepting submissions from writer/director/producer teams, as well as individual applications from writers and directors. The deadline for applications is the 16th November. There’s a lot of talent in Wales who have desperately needed this scheme for a long time, so fingers crossed that the finished films will reflect the potential of the people here. Get your applications in. There’s a mentoring element to the scheme that will hopefully be very useful. On a side note, reading through the guidelines, I’ve noticed that “only original and newly-composed music or pre-cleared library music (cleared for all formats) can be used”. So take out that bit in the script where the protagonist drives down the street to the Stereophonics. Please. How Do I Get My Short Film Onto IMDb? 17 now has its own title page on IMDb. Having a page on IMDb for your film is essential – it obviously raises the profile of your film, but it also adds credibility to the project. IMDb is often the place that people turn to first for information on any film (feature or short), so you need to be on there. What’s the quickest and easiest way to do it? It used to be a long and laborious task to enter the data onto IMDb, and with their strict criteria for accepting submissions, it could even be a total waste of time when your submission is rejected. Now, it’s quite simple. Register an account at WithoutABox, create a project for your film, and enter your film’s details. You can do this before your film has even been completed – of course, there’s still a lot of data to enter, but when you think that, in recent years, you would have to enter all these details separately every time you entered a film festival, this is nothing. If you’ve got good paperwork and the beginnings of publicity materials from your shoot, you should find this quite easy. If you enter your film into any of the ‘IMDb qualifying festivals’ listed on the main page, your IMDb title page will be generated as soon as your submission is received, not when it is accepted. So, even if your film is eventually rejected by the festival, you will still get your entry onto IMDb. There’s a varied list of worldwide festivals – I entered 17 into the Swansea Bay Film Festival in Wales, a local one for us. If you’re lucky, you might be able to get a discounted entry to a festival if you’re early for the festival’s deadline, but even if you don’t, it’s still incredibly good value for the amount of good publicity having the IMDb page brings you and your film. Don’t forget, once all your film’s data is entered onto Withoutabox, there’s a ton of festivals you can enter with just a few clicks of the mouse, and some with very cheap entry fees. Pick your festivals wisely, and try and come up with a strategy that gives you the best value for money if you’re on a budget. Good luck. I’m delighted to announce that, at 6pm tomorrow, 17 will receive its world premiere at the Portobello Film Festival in London. It’s showing in the World Cinema section, which in itself feels like an accolade – Wales is part of the world, though of course. The full listing for the section is here, and our film is showing before the Bolivian-set US feature film Pachamama. Congratulations to Jamie Bolton, the writer-director, and all of the cast, crew and financiers. Thanks once again to you all for your hard work on the film. It’s good to know that the film is now beginning to find an audience, which is the whole point of making these things in the first place. You can download a PDF of the Festival’s programme here, there’s an image of Chris Conway from the film on page 16 of the programme (page 19 of the PDF).